Alexei Ratmansky’s ‘reconstruction’ of The Sleeping Beauty at La Scala made for one of the most interesting and satisfying evenings that I’ve had in the theatre for a long time. It is charming, it is theatrical, it is technically retro-innovative and also demanding for the dancers. Reintroducing some positions and movements, which have been gradually dropped from classical ballet’s repertoire of steps, was to see them anew, as though inventions by Ratmansky himself. Yet these were shapes that Petipa created, accurately preserved by Vladimir Stepanov, using his own notation system, in 221 pages of priceless manuscripts. The bent knee is the change which makes the biggest impression: an arabesque with a curved leg gives a gentler line and the overall effect is one of softness… goodness. 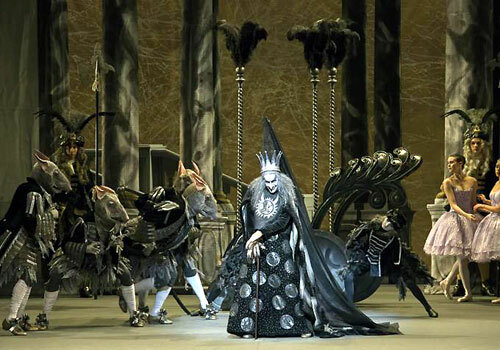 The contrast with Carabosse’s spikiness – from the pointed-finger curse to the pointed crown – is striking. Then there are chaîné turns in demi pointe (fast!) but not only: during the final pas de deux Aurora rises up on full pointe for her chaînés. She is charming with the care she takes in executing each delicate movement, and she and the various fairies share an exotic variety of épaulement and employ a deep cambré. They also use a retiré at different heights (but never higher than the knee) allowing faster turns. It is full of Cecchettian footwork – fast and intricate – especially for Prince Désiré’s variation which is like Bournonville on steroids. The attention to detail puts magic into even the smallest of steps. One of the most apparent changes is to keep a lower leg – no knees-to-ears here. Being that the leg travels less, it takes a shorter amount of time to arrive at, and return from, various positions, which allows the music to be played up to speed without the lulls normally required to accommodate more expansive movements. The lower leg position has the added advantage of avoiding ugly ‘crotch-shots’ and allowing the tutu to drape elegantly on the thigh. Unlike The Royal Ballet, for example, where mime has always been given importance, the La Scala Company has often looked ill at ease with ballet gesture; strange in a country where gesturing is in its DNA. In this Beauty the storytelling is wonderfully clear. Ratmansky has obviously convinced the company to go for it, make it big, make it understandable and, in doing so, make it believable. The dancers were confident and clear and didn’t announce, ‘Here’s a boring moment, but soon we’ll get back to the dancing!’ So much better; it lets the story zip along. Ratmansky’s take isn’t an historical recreation, but an effort to restore as much of Petipa’s choreography as possible while taking into account our current vantage point, 125-years after the ballet’s creation. Therefore, being a man of the theatre, he doesn’t hesitate about leaving in a few later additions such as the Rose Adagio balances with Aurora crowning her head in fifth position, and the pas de deux fish dives, elements that a modern audience would miss too much. The dance vocabulary is only enriched not impoverished by Ratmansky’s interventions. This is not the only way to dance this ballet, but it is certainly one way, a way that works magnificently, providing thrills in the minutiae rather than in larger-scale effects. Ratmansky chose to base the designs on the 1921 production designed by Léon Bakst for Diaghilev’s Ballets Russes. As with Ratmansky’s approach to the choreography, the designer Richard Hudson does not copy Bakst, but uses the original designs as a starting point so that his own designs echo the sentiments of that production. There are bold blotches of colour in often surprising colour schemes, exaggeratedly ornate costumes for the royal court, a chariot for Carabosse which Hudson presents as a creepy rat-drawn Victorian funeral hearse with black feathers, and painted-cloth sets, though here he leaves Bakst’s designs more or less untouched. Lilac trees surround the royal palace illustrated on the front-cloth and lilac petals on transparent gauzes descend asynchronously at the end of the first act as the Lilac Fairy casts her spell on the court… a nice touch. Although this production, with its 400 costumes, cost six-million dollars, (divided between La Scala and the American Ballet Theatre, where it was first staged), the budget apparently didn’t stretch to recreate the original moving panorama backdrop to accompany Prince Désiré’s journey to find the sleeping princess. In fact, the front-cloth drops in just after the boat of the Lilac Fairy and the Prince starts to move, so there is no portrayal of his striving to find the palace. The cloth flies out again, and hey presto, he’s already in the door, with Aurora sleeping just a few paces away. A pity. Oh yes, and there was one blissful moment when a small gold scallop shell, about the size of a football, is brought to centre-stage during the vision scene. Aurora slips one pointe shoe into a special groove inside it and then remains there, in arabesque, like the ballerina on top of a music box. Simple. Magical! In Milan, Svetlana Zakharova was Aurora and I have never found her so enchanting and seen her radiating such a warm presence. She respected the choreography which gave a round slap in the face those who were wagering on the fact that her 180-degree leg would, literally, pop up at some point. Her Prince was a substitute of a substitute – both David Hallberg and Sergei Polunin had to withdraw – but a recently graduated dancer from the La Scala Ballet School, Jacopo Tissi, held his end up admirably. He is physically the perfect match for Zakharova – long and lean – and yet he managed to get round the complexities of his variation at lightning speed; no mean feat when you’re six foot two. While on lighting speed, another new name, Angelo Greco, from the same class as Tissi, flew around the stage as an outstanding Bluebird. Nicoletta Manni as the Lilac Fairy showed off her customary secure technique with panache, and Carabosse was played by a commanding Massimo Murru, splendid in his steel-wool wig. The La Scala company and soloists are in impressive form, but Maria Celeste Losa as the Diamond Fairy stood out. Nineteen-year-old Losa was a Prima Ballerina at the Argentine National Ballet and has just joined the Milanese company; this was the first chance to see her, and very promising she looks too. It should be noted that for the past fifty years at La Scala, Rudolf Nureyev’s production has reigned supreme, and from the mid-nineties has been clothed in a super-chic design by Ezio Frigerio and the most exquisite and nuanced costumes by Franca Squarciapino. To see this new Beauty is like leaving an Armani showroom and popping in to Dolce & Gabbana. Lots of La Scala stalwarts were wailing about poor ’Rudi’; complaining about how the choreography compromised the dancers’ technical possibilities; commenting on how Nureyev created a fairy tale for adults and that Ratmansky’s is for children (but not in a positive way! ); insinuating that the production is banal; saying that modern dancers, with their taller physiques and longer muscles, can’t adapt to this style with its old-fashioned steps; that this type of reconstruction is a purely academic exercise, without theatrical value; etc, etc. Of course, such arguments could be countered one by one – Why were the large number of tourists in the audience lapping it up if it was only for connoisseurs? Why can dancers manage to leap from Giselle one week to Mats Ek the next even though the styles are so different? And so on – but the root of the ‘problem’ may be just sentimental. After having enjoyed so many evenings of extreme pleasure with Nureyev’s Sleeping Beauty and its complex weaving patterns for the corps, often eccentric choreographic movements, and the long second-act variation for the prince, this production certainly is a jolt. If they were in another theatre with a different company maybe some of the (quite violent) negative reactions would be calmed. Like preferring the old sepia version of the Sistine Chapel to the restored one with its flashy colours – change is often a shock. Or maybe I’m wrong. Whatever, the applause was loud and enthusiastic and the dancers, too, looked as though they’d had a thoroughly good time. What a lovely review! I very much appreciated the technical insights in it about leg position, footwork etc. Bournonville on steroids is a great description! I was thinking back to the show today and made a similar comparison with the ‘sunniness’ of that style and the recovered Petipa stylings of Ratmansky’s work. I am also glad that someone else thought Ms Losa was wonderful, too. I am also hoping for more from her. Losa looks a great find, doesn’t she! It is indeed ‘sunny’ which I think reflects not only parts of this ballet but also part of Ratmansky’s character… what a nice guy! Ciao Nick. I sent you my thoughts on this ballet, most of which you covered in your wonderfully well written review. My main objection is lack of roles for the male dancer. Ratmansky, who deliberately included a triple tour in the Don Q he staged for the Russians, and I might add greatly admired Ivan Vasiliev when he did it, takes a gigantic step backward in this SB. Men as Poteur. Men are finally coming into their own in ballet and this SB takes them back to the male dancer of the 1800’s. He did the did the same in Paquita and will no doubt do it again in SL. Luckily I have the Nureyev version on DVD a sorry substitute, but better than what Ratmansky offers. “On Tuesday March 3 I went to the Segerstrom Center at the Orange County Performing Arts Center. The performance by American Ballet Theater was the Sleeping Beauty choreographed by world renowned choreographer Alexei Ratmansky. I saw Diana Vishneva as Aurora, Marcelo Gomes as Prince Desire, Veronica Part as the Lilac Fairy, Daniil Simkin as the Bluebird. I had grave doubts before going to this performance. 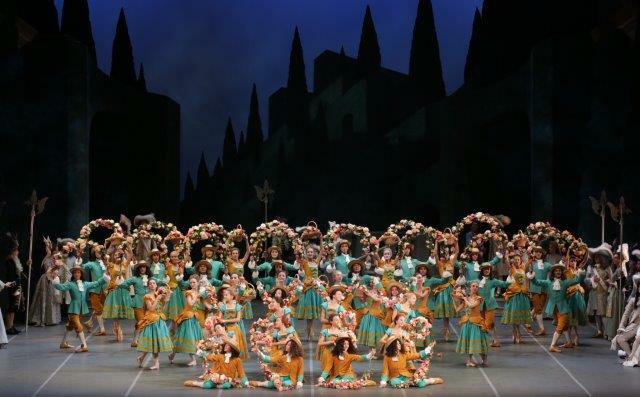 Alexei Ratmansky recreated this Sleeping Beauty from the original but, according to Ratmansky, unexplored notation by Vladimir Stepanov from the original choreography by Marius Petipa. The cause of some questioning on my part. Dancers are taller, leaner, more muscular. Costumes are stripped down to allow a clear view of the dancers body and thus the technique. Shoes are drastically changed and allow greater flexibility of the foot, and feet are stronger and more gracile. Floors and lighting have improved. In short, things have changed. It is unclear to me whether Marius Petipa would have created the same ballet on present day dancers with all these changes as he did with the cutting edge technology of the late 1800’s. This, I believe, was the cause of my confusion with the choreography. I was not sure whether I was watching poor dancing or outmoded choreography poorly constructed.. The costumes, not reproductions to complement the choreography, were a huge problem for me. Large, gaudy, overly ornamented they glittered, glistened and sparkled. The men wore layers of fabric in pink pantaloon-like dresses covering pseudo Russian uniforms. The Lilac Fairy danced her variation in Act 1 in a long tutu and toe shoes, by the 3rd Act she was in a purple slit to the waist burlesque costume complete with a long show girl type feather head dress. Not only were the costumes suitable for a 30’s style burlesque show, the dancers swanned around like silent movie stars. Finally, the humor of this SB, which should be a highlight of this usually over wrought ballet escaped me entirely. Humor can be subtle but perhaps not so subtle it escapes a majority of the audience. I just wondered why? Your positive review goes a long way with me – hopefully there will be a recording of this production to buy or at least link to to watch. Yes, I hope so too Peter… there is so much to see over and over again!